Spring Start-up, Lawn Sprinkler Activation, System Tune Up. Time to turn the lawn sprinklers on! You might ask why you need to pay a professional to turn on your lawn sprinkler system in the Spring. That is a very good question and it all comes down to what services or irrigation expertise you are paying for. 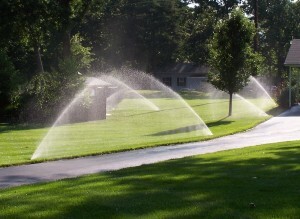 Many irrigation contractors provide very little service for the fees they charge. If you are paying to have the water turned on, backflow reinstalled and the controller turned to the on position you need not pay anyone for that service; just do it yourself. On the other hand a professional spring sprinkler activation and tune up should consist of the following items to ensure your system is operating at optimum performance and is not wasting water. TriState Water Works provides the following system inspection and basic tune up. Inspection and cleaning of backflow to eliminate leaks. So how much should you pay for a sprinkler spring activation and tune up? If your sprinkler contractor is not providing most of the services listed above you are paying too much no matter what the price is because you are receiving no value for the money spent. TriState Water Works has a base price for residential system with a 5/8 inch water meter of $80.00 for the first eight zones and charges $10.00 for each additional zone. If the system is in need of major repairs and has more than five sprinklers that need to be straightened or raised, additional charges may be necessary. The difference in cost between what TriState Water Works charges and what others charge is usually recaptured in one water bill because we optimize the water use of your irrigation system. When should you have your sprinkler system turned on? Usually any time after the second week of March is a safe bet for starting up your sprinkler system. I recommend calling early in the season to schedule your lawn sprinkler start-up; the best time to tune up your system is before you need it. For a free report on why your irrigation system could be wasting 30% or more of your water and what to do about it, click here for our free report “How To Save 30% or More on your Irrigation Water Cost”, and join our email list. We will send you a link to the free report.